GeekGirlCon is happening next weekend and there are still plenty of passes left, so if you’re in the Seattle area, come check it out! GeekGirlCon is open to everyone, so feel free to bring your boyfriend, girlfriend, friends, co-workers — whomever! Nerdy But Flirty’s SarahTheRebel will be hosting a panel on ‘Opportunities for Women on YouTube’ Sunday, October 20th from 4:00 – 4:50pm. Panelists include Holly Conrad of CrabCat Industries (you may know her as a Renegade Femshep cosplayer) and Kiri Callaghan of Geek & Sundry, so be sure to go and show her your support! Geek Girl Con special guests include actress Denise Crosby, who played Lt. Tasha Yar on Star Trek: The Next Generation; puppeteer Karen Prell, who will be joined by Red Fraggle courtesy of The Jim Henson Company; Jane Espenson, writer for Buffy the Vampire Slayer and producer of the hit web series Husbands; comic book author Kelly Sue DeConnick; and professional cosplayer Chaka Cumberbatch. 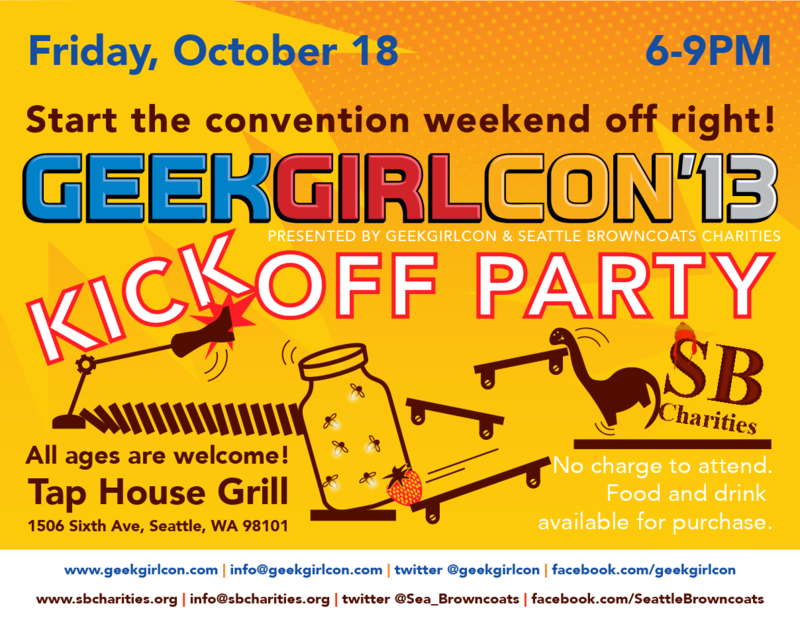 GeekGirlCon will be hosting a kickoff party on October 18th at the Tap House Bar and Grill. It’s free to attend, with food and drink available for purchase. GeekGirlCon ‘13 will be held at The Conference Center, located in downtown Seattle, and will include panel discussions, opportunities for job networking, crafting workshops, special events, tabletop and console gaming, and an exhibitor hall and artist alley. So come geek out with us next weekend! Hope to see you all there!